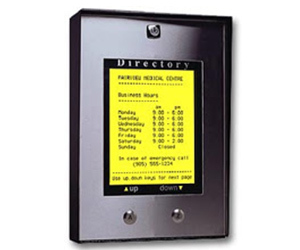 The 7000 series is a complete lobby entry system with built-in full page electronic directory. It comes with a standard 700 name capacity as well as a title page. Since it displays 20 names at a time, finding a name is quick and simple, unlike systems with 1 or 4 names per page. Rugged construction using 16 gauge stainless steel faceplate and "lexan" window for the display screen protection. 4, 7, 10 and 11 digit dialing capability. 26 point font size, Upper and Lower case. 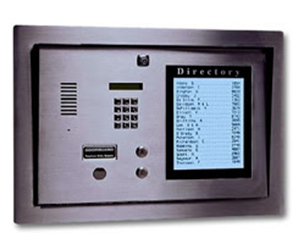 2 Programmable Relay outputs to control door strikes, gates, cameras, etc. Tone and Tapping Rejection circuitry to prevent Unauthorized Entry.